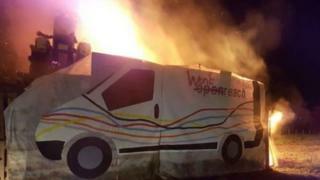 A giant effigy of a BT Openreach van has been burned at a village bonfire in frustration over slow broadband speeds. Templeton residents chose to turn up the heat on the telecommunications company as many are struggling with speeds of less than 1 megabit. Roger Linden said villagers were told the problem would be looked at three years ago, but nothing has happened. BT said Templeton in Devon is extremely rural, which made the rollout of fibre broadband "more challenging". It said it was working hard to find alternative ways of bringing faster broadband to residents, including a community fibre partnership and a mobile broadband solution. But Mr Linden is not convinced the company will be able to deliver. "They managed to get a cable to the nearby hamlet of Nomansland, but just eight kilometres further and there's nothing. "It's incompetence of the first order... but we all had a great evening watching the bonfire." Adam Short, who moved to the village about 18 months ago, said he helped create the van effigy - marked with the words "won't reach" - on the floor of his barn. "We knew it was terrible before we moved, but we hoped there would be a solution," he said.